As Congress approaches the last scheduled week of its lame duck legislative session, we wanted to report on developments that we believe to be of major interest to our clients and friends. The legislative agenda of the lame duck session of Congress continues to focus on three major packages of legislation: tax extenders legislation that passed the House of Representatives Wednesday, December 3rd; the National Defense Authorization Act of 2014, which contains a major lands package and passed the House Thursday, December 4th; and a CROmnibus or other funding package to fund the government past December 11th, the expiration date of the current Continuing Resolution. In addition, organizational decisions for the 114th Congress continue to be made and there is a possibility that the Senate may remain in session past December 11th to take up confirmations. We will continue to report any relevant news. Excise tax credits relating to certain fuels – §6426 & §6427. The overall package is estimated to cost $41.6 billion over 10 years and does not include any revenue offsets. The bill also includes a package of technical corrections to the Internal Revenue Code that the House Ways and Means Committee and the Senate Finance Committee recently finalized. Before the vote on the House one-year extender package, Senate Finance Chairman Ron Wyden (D-OR) had expressed hope that Congress might still consider a two-year tax extender bill. However, on December 4th, Chairman Wyden told reporters he doesn’t expect the Senate to make any changes to the House-passed bill. Ranking Member Orrin Hatch (R-UT) has also expressed his support for the House bill. If the Senate passes H.R. 5771 without modification, President Obama is expected to sign the one year tax extenders package into law. A National Defense Authorization Act (NDAA) has been enacted each year by Congress for the past 52 consecutive years. This legislation reauthorizes Pentagon and defense-related programs and is considered “must pass” legislation. In the House, the NDAA was an amendment in the nature of a substitute to H.R.3979, the Emergency Unemployment Compensation Extension Act of 2014. The House passed the NDAA package by a vote of 300-119 on Thursday, December 4th. The Senate is expected to consider H.R.3979 as early as Tuesday, December 9th, with a vote on final passage expected late next week. Section 3021. Bureau of Land Management Permit Processing - amends Section 365 of the Energy Policy Act of 2005 to eliminate the pilot project status of the Bureau of Land Management’s (“BLM”) Federal permit coordination program. Section 3021 also establishes a “BLM Oil and Gas Permit Processing Fee” of $9,500 for each new onshore application for a permit to drill on BLM lands. Section 3022. Internet-Based Onshore Oil and Gas Lease Sales - amends Section 17(b)(1) of the Mineral Lands Leasing Act to permit the Secretary of the Interior to conduct internet-based bidding for onshore oil and gas lease sales. Section 3023. Grazing Permits and Leases - amends Section 402 of the Federal Land Policy Management Act. Among other things, the provision allows a grazing permittee operating under a new permit or lease to adopt the terms and conditions of an expired lease until the completion of environmental analysis under the National Environmental Policy Act (“NEPA”). The provision allows for certain grazing permits and leases to be excluded categorically under NEPA where the permit or lease “continues the current grazing management of the allotment” and where grazing activities do not contribute to the detriment of the public land involved. Section 3087. Bureau of Reclamation Hydropower Development - amends Section 9 of the Water Conservation and Utilization Act of 1939 to permit the Secretary of the Interior to “enter into leases of power privileges for electric power generation in connection with any project constructed pursuant to [the] Act.” By providing such authority “in addition to and alternative to any existing authority relating to a particular project,” more hydropower development could occur at certain Reclamation facilities through the lease of power privilege process. Section 3096. Payment in Lieu of Taxes (PILT) - provides the Secretary of the Interior $70 million for PILT payments without the need for further appropriations. PILT payments are made to local governments with non-taxable federal lands such as BLM lands and National Park System lands within their jurisdictional boundaries. The payments are intended to offset losses in property taxes due to the presence of these federal lands. Probably the most contentious legislative package yet to be considered in the lame duck session of Congress is the legislation that will fund the government beyond December 11th. This legislation, which some are calling a “CROmnibus” is a combination of a continuing resolution and an omnibus appropriations bill. Recent reports suggest all agencies except the Department of Homeland Security are likely to be funded through September 2015. While the tax extenders package and the defense authorization package have been voted out of the House of Representatives, no action in either chamber has yet occurred with regard to funding the government. This legislation is likely to be the focus of significant debate during the week of December 8th. 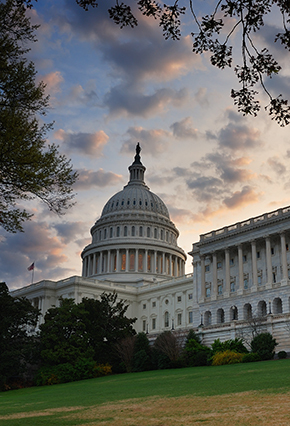 Since our last election alert, additional decisions have been made by House Republicans in the Committees on Energy and Commerce, Appropriations and Ways and Means. House Energy and Commerce Committee Chairman Fred Upton (R-MI) announced seven new Republican members (replacing six members who either ran for other office, lost their re-election or retired). The new members will be Rep. Susan Brooks (IN-5th), Rep. Larry Bucshon (IN-8th), Rep. Chris Collins (NY-27th), Rep. Kevin Cramer (ND-at large), Rep. Bill Flores (TX-17th), Rep. Rich Hudson (NC-8th), and Rep. Markwayne Mullin (OK-2nd ). The current chairmen of the remaining Appropriations subcommittees will retain their gavels in the 114th Congress. However, four new Republican members will join the House Appropriations committee: Rep. David Jolly (FL-13th), Rep. Scott Rigell (VA-2nd), Rep. Evan Jenkins (WV-3rd), and Rep. David Young (IA-3rd). We have updated our list of Subcommittee chairs designations here. The House Democratic Steering Committee has yet to determine committee assignments for its members, but an announcement of those selections could come as early as next week. On December 3rd, the Democratic Steering Committee announced to House Democrats that there are 4 vacancies on the Energy and Commerce Committee, 1 vacancy on the Financial Services Committee and no vacancies on the Appropriations and Ways and Means Committees. In the Senate, Democratic leaders created a new leadership position for Sen. Mark Warner (D-VA), who will serve the Democratic Caucus as Policy Development Advisor.